I was sitting in the coffee shop last Friday getting some work done to finish out the week. While I was sitting there about 6 ladies sat down at the table next to me. They started talking about how it’s so hard to keep a new years resolution and about how many times they failed with a workout program. I think the main reason people fail is they lack a specific plan. If you fail to plan, your plan will fail. I always say that working out should be like brushing your teeth….part of your lifestyle. Brushing your teeth is just something you do twice per day without thinking about it. That is the goal with a workout program. Make it part of your routine and enjoy it. After Jeremy’s 100th session, we rewarded him with a Premier hoodie for a job well done. 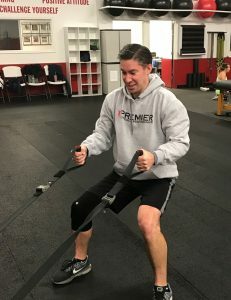 If you want a plan and are ready to take your fitness and health to the next level in 2019, email us at info@premierfitnessoh.com and we’ll help get you on the right track.